Today, the success of your organization may depend on effectively safeguarding the resources and information in your data center. A major element in the most successful data center threat defense strategies is clear visibility into traffic flows. Data center operators are challenged with continually adjusting traffic-flow volumes and infrastructure to meet the needs and expectations of the business while complying with all necessary security regulations. 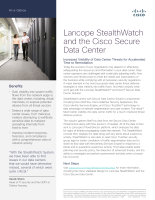 Lancope StealthWatch works with Cisco Secure Data Center Solution components to take advantage of network segmentation and user context. Download this one-page paper to explore how the result is much better visibility into data center traffic for a much-improved threat defense posture.